Medacist provides the RxAuditor analytics suite as a SaaS delivery model to the acute and long-term health care industry assisting its clients in a variety of ways through the following services: RxAuditor OnDemand, RxAuditor 360, and RxAuditor CPA. As the innovator once again, Medacist advances to the next level. RxAuditor’s patented algorithm has recently been enhanced with artificial intelligence, pattern recognition, and predictive diversion targeting, which delivers the highest assurance metrics in the industry, unparalleled. RxAuditor, SaaS Analytics Platform that drives key metrics to pharmacy and nursing leadership to better measure, monitor and manage the medication use process across central pharmacy packaging and distribution to automated dispensing to patient electronic medical record administration. Clinical - Metrics associated to medication errors, adverse drug reaction, medication override, waste and discrepancy. With a primary focus on drug diversion. Operational - Analysis of key performance metrics associated to the optimization, optimal inventory levels based on historical usage, stock-out, refill optimization, dispense-to-refill analysis, hardware error analysis. Economic - Analysis of medication cost, inventory turn analysis, expired medication loss, inventory loss (shrinkage)from discrepancies. RxAuditor, best in breed, patented drug diversion analytics – RxAuditor web-enabled drug auditing system provides customers with the ability to proactively measure, monitor and manage key automated dispensing system metrics in real time, which ultimately leads to increased clinical, economic and operational value. RxAuditor OnDemand also provides comprehensive monthly analytics, providing trending and detailed audit reports depicting statistical abnormalities associated with clinical-, economic- and/or operational-related automated dispensing system transactions. RxAuditor 360, our unparalleled patented dispense-to-administration medication reconciliation analytics, provides the healthcare professional the ability to reconcile RxDispensing (ADS) transactions with RxAdministration (EHR) transactions in order to improve patient safety by providing analytics necessary to close the loop in the medication dispensing-to-administration process. 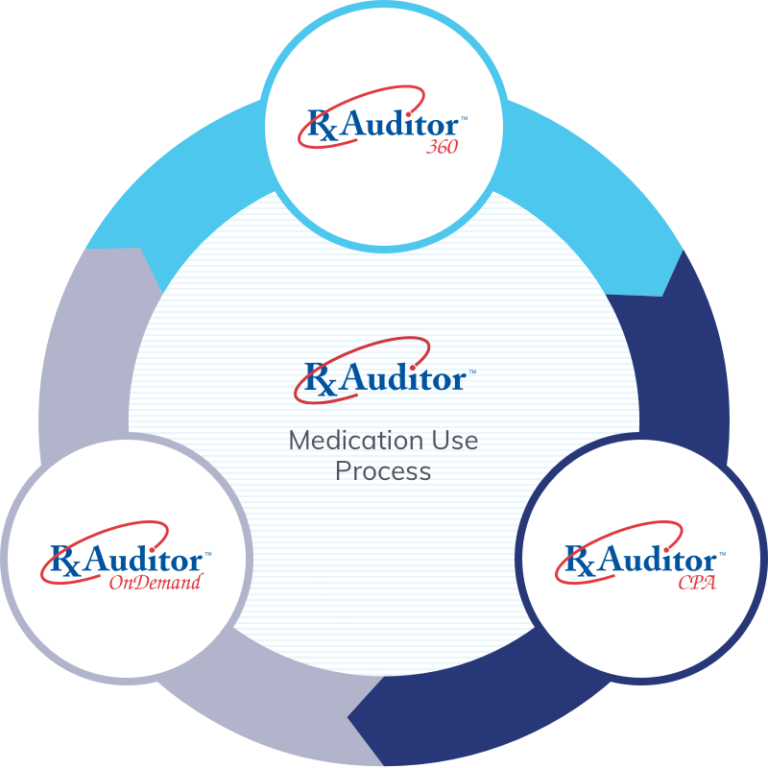 RxAuditor CPA provides health care professionals the ability to reconcile transactional activity associated with the central pharmacy’s automated storage systems. Delivering analytics associated with packaging and distribution of medications from the health care facilities central pharmacy to the automated dispensing systems.